We have both virgin and remi hair . That is virgin without any chemical process and remi if the buyer wants to get the hair textured into a particular style. All hair from us are cuticle healthy and cuticle correct aligned so that the hair is as tangle free as possible. We guarantee our hair to last up to one year. Our guarantee is for no inferior mix and for zero shedding, and no tangling. 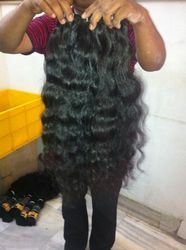 Since hair that we supply are 100% natural human hair, these can be dyed , bleached , curled or straightened. All hair products are made after the natural hair is sterilized so there is no lice or nits.